As an athlete who trains intensely your body is more prone to wear and tear and the increased demands will inevitably lead to sore joints and muscle pains. If you’re pushing your body to the extreme at the gym you demand something that will alleviate this pain quickly and effectively. Advanced ALLFLEX, powered with UC•II® was strategically designed to provide support and relief from the pounding your body takes in and out of the gym. With a an exclusive delivery system ALLFLEX™ is provided through a rapid-release micro-thin capsule that delivers results quickly and has a sustained-release formulation that continues to work over a 12-hour period. Your joints take a pounding, and until now, there has been just the regular “same old” joint ingredients. Backed by the strength of 6 Human Clinical Trials, ALLFLEX with UC-II has given you the tools to fight back! 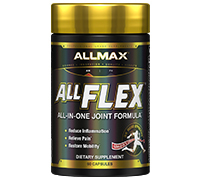 Advanced ALLFLEX is 348% better than both Glucosamine and Chondroitin combined on reports of pain reduction and improved joint mobility. It’s so easy to take; just two capsules once a day! The key to this impressive and highly advanced formula is a combination of UC-II® Undenatured Type-II Collagen for joint repair, 5-LOXINOL™ for inflammation and OptiMSM® for joint mobility with potent CL-5™ for Free Radical Reduction and Antioxidant support! Clinically shown to be more than 3 times as effective as a combination of 1500 mg of Glucosamine and 1200 mg of Chondroitin. A powerful joint-specific anti-inflammatory and a newly discovered antioxidant which can help address oxidative damage to joints. UC•II has been found to be superior, safe, completely natural and effective ingredient for joint and pain management. This superior ingredient is effective at pain and joint management and is manufactured through a low-temperature process that ensures the biological activity remains intact. UC•II is a revolutionary new approach to joint and pain management and is backed by six human clinical trials, including one conducted at the prestigious Harvard University which found that study participants experienced substantial improvement with the addition of UC•II® and best of all, experienced no side effects . 5-LOX is an enzyme that promotes inflammation. Research has shown that 5-LOXINOL™ has a powerful 5-LOX inhibitory effect, reducing the joint inflammation that can cause pain and immobility.As an extract of the of Boswellic serrata plant, which has been used for thousands of years in traditional medicine to provide support for joint pain, 5-LOXINOL is the most potent and effective form of Boswellic Acid Extract available. In research, Boswellic Extract was found to reduce inflammation by inhibiting proinflammatory 5-lipoxygenase chemicals and blocking leukotriene synthesis. Those with joint pain are often looking for a natural alternative and 5- Loxinol provides a well tolerated and safe alternative. MSM helps repair damaged cells and promotes the growth of healthy new cells. MSM is necessary for joint collagen synthesis. Collagen builds a powerful matrix to help strengthen joint tissue while simultaneously providing flexibility. It is also an ingredient and protein and essential for growth and repair of cells. MSM is a natural sulfur compound in fruit, vegetables, fish, milk and grains. In Human clinical research trials MSM was found to relieve pain and stiffness and reduce swelling and inflammation. It has been found to be a safe and effective method to provide joint comfort and increase join range of motion. CL-5™ provides powerful joint tissue protection from Free-Radical Oxidative damage at the cellular level and has been found to be more than more than 300 times the antioxidant power than vitamin E. This has been used in traditional Asian medicine to alleviate pain associated with arthritis and reduce inflammation. Furthermore, it can help inhibit the production of prostaglandins. The ultra-pure, bio-available herbal extract Salix Alba has been carefully combined with the core ALLFLEX ingredients to reduce inflammation, joint pain, swelling and stiffness. Salix Alba or white willow extract is derived from a large tree indigenous to Central and Southern Europe, Asia and North America and has long been utilized for its inflammation properties. It has been recorded as being one of the oldest forms of natural painkiller in human history. Specifically, the inner bark of white willow contains tannins which have been suggested as being responsible for pain relief and reduction. It has also been found to inhibit prostaglandins (chemicals produced in response to injury to the body). White willow often referred to as ‘nature’s aspirin’ and provides a powerful but completely natural approach to treating aches and pains. Vitamin C is a water soluble vitamin and antioxidant that is essential for high performance athletes. It provides support to the immune system under stress and intense training and helps maintain collagen, which is essential for the formation and repair of connective tissue. This powerful antioxidant helps improve circulation and is necessary for tissue repair. It is also helpful for normal blood clotting, healing and prevents scarring. It provides athletic support by relaxing cramps and maintains healthy nerves and muscles while strengthening capillary walls. The alpha form of Vitamin E has been found to be the most potent form. Osteoarthritis Cartilage. 2006 Mar;14(3):286-94. Epub 2005 Nov 23. Kim LS, Axelrod LJ, Howard P, Buratovich N, Waters RF. 2006. Efficacy of methylsulfonylmethane (MSM) in osteoarthritis pain of the knee: a pilot clinical trial. Osteoarthritis Cartilage 14:286-294.